One morning, when I was a little boy, I found a string lying in the grass by a tree. I picked up the end of the string, surprised to find it there. I pulled on the string and watched as it lifted into the air parting the blades of grass, wet with the morning dew. As it rose from the grass droplets of dew sprayed into the air around it turning to mist, creating rainbows that wavered before me in the bright morning light. I shook the string watching it zigzag through the air and swung it around in circles as if I were playing jump rope with my friends, amazed by the way it stretched across the yard and on into the distance. I pulled on the end of it wanting to gather the string and explore its length. The weight of the string seemed to pull back as if something, or someone on the other end were waiting for me to follow, for surely there was an end somewhere. Had I not already found one of them? I began to follow the string, pulling on it as I walked across the yard, pretending that I was a mountain climber making my way across a vast mountain range, made up of black crumbling shale cliffs that could break away from under my feet at any moment. I followed it across the backyard, around the garage, past the rusting gardening tools and dry rotting old tires and down to the street running parallel to the small houses placed neatly in a row along its borders. I stopped and looked back at my house before following the string across the street, knowing I should not leave the yard. I stood there for a moment, feeling as though I left something important behind, feeling as though there was something I should say—or do. I saw my Grandmother standing at the sink in the kitchen, her silhouette clearly visible through the glass and sun faded curtains and I watched her there cleaning the morning’s dishes. I waved at her—but she did not see me—and so I said goodbye in a small voice heard only by the birds singing in the trees above me, watching with wary eyes and nervous wings. 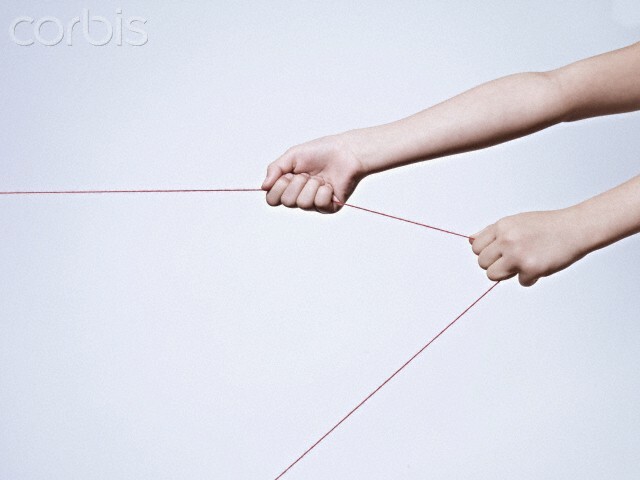 I began to gather the string and follow it, pulling the rough string with my little hands, feeling its fibers vibrate with anticipation each time I let go with one hand and pulled with the other. After a short while I turned to see how far I had gone, and the little house, the first one of my memory, began to slip away, becoming smaller and smaller as the string began to pull me along as quickly as I could follow. I suddenly felt as though the string needed me to see something of great importance. It was as if whatever waiting for me there—on the other end—could not wait for me to arrive. A sense of urgency far too great for me to ignore pressed me onward, moving me toward something that I needed to see, something that needed to see me. Hours passed in seconds, weeks passed by in minutes, years passed by in days and I followed the string, looking up occasionally to see a house, or a girl with a beautiful smile, reaching out to me as I walked along with the rough thread sliding through my hands. Still, I followed, amazed at the prospect of finding the end. For surely there was an end somewhere—wasn’t there? Once, when my feet grew tired, my hands grew cold and cracked, and my hunger for rest became more than I could bear, I tried to drop the string and go back home. Finding the end no longer seemed important to me. I wanted to be still and rest. I wanted to enjoy the world around me. I wanted to live in the moment. I began to realize that the world around me passed by as if I did not even exist, as if I were nothing more than a dandelion seed floating in the wind. I had become insignificant, an echo in the void. I longed to see the past again and feel the warmth of my small room filled with books, games and toys. When I turned to see where I had been, nothing waited for me there. The past was vanishing behind me as if an eraser of enormous proportions were wiping it from the pages of my life, leaving only blurred images, vague memories, forgotten words and faces. When I stopped walking in revolt against its power, it pulled me along faster causing me to run in an effort to keep up. The world passed by in a blur of noise and confusion. I watched as family and friends disappeared behind me, some said their goodbyes—their voices broken by the wind rushing in my ears. Some simply turned away, as if they never knew I was there. Trees grew and fell away; children lived their lives without me. Still, I followed the string, praying that the end was near. My body began to fail, my legs began to shake, no longer capable of supporting the weight and wear required of them. I fell to the ground and stared up at the sky watching in amazement as tattered clouds passed by chasing the Moon. The Sun rose and set bouncing on the horizon like the blinking of a giant bloody eye. The string pulled me through the dust of time and over the bones of those fallen before me as I watched the stars above, dancing in the blue-black ocean of the night. I prayed to the heavens, to the gods of the Moon and the God of our fathers, pleading with them to let me go home. I closed my eyes and listened to the voices of the past and the voices of my weak and weary heart. I slept and dreamt the dreams of the forgotten. I looked up into his hazel eyes and I began to fall. His hands slipped out of mine and I fell through the darkness, flailing my arms, as the string tangled around my legs until I jerked to a stop hanging upside down in the dark, suspended in space. I awoke, startled and screaming and opened my eyes to the dazzling sunlight slicing over the rooftop of my childhood home. The sun shining on the wet grass created sparkling diamond reflections in the air around me. I rubbed my eyes with my fists as I rose to my knees in the grass by the tree where I lay—blinking and struggling to make sense of where I was. Birds sang kindly in the limbs above me, welcoming me to the new day, and the string was gone. I looked at my hands; they were still soft and new, with only the faint wrinkles of life beginning to form in the smooth pink palms. I stared at my hands opening and closing them, hands that would learn to play a guitar someday, hands that would build sandcastles and bookcases, hands that would pull wriggling fish from the ocean and the hands that would hold the hands of my children. I stood and looked around, I was home again and my heart filled with hope and relief. I heard the familiar squeaking of the hinges on our screen door and I turned to see my grandmother walking out onto the porch wiping her hands on her apron. I ran to her and hugged her at her waist nearly knocking her down. "Here now what's this about?" she said, pulling me back and looking at me, surprised by my sudden show of affection. "I'm just happy to see you that's all," I said. She looked at me with a question in her eyes, as if she knew something, as if something in my eyes frightened her. She held my face in her hands and smiled. She opened her mouth to ask—but then changed her mind. "Go eat your breakfast," she said, and opened the screen door. I looked back for a moment, scanning the yard, making a mental note of the bushes and trees, the garage and the fence, the layout of my world, the way I would always remember it. I looked up at her, she smiled and nodded and I went inside. The warmth of the kitchen filling my soul.